The state of the Roman Catholic Church on the eve of the Protestant Reformation was absolute shambles. The priests, bishops, and the pope kept the scriptures from the people. The clergy would use the Church for their own gain, leaving many thousands of people without any teaching at all. The Bibles were barred from the pulpit, and obscure verses would be preached in Latin to the ignorant serfs. The Dark Ages were a time of spiritual backwardness, all such knowledge being withheld by the Roman Church and possibly a few of the higher ups in the nobility. Some would argue that the Roman Church kept Western Civilization alive. Except for the preservation of ancient documents, which would easily have been done by others and been more widely available than ever, the Roman Church did little to nothing to advance or even protect Western Civilization. It wasn’t until those documents were removed from the monasteries through war, or from learned men becoming Protestants following Martin Luther’s stand against the Papacy, that a free market was allowed to flourish. As the Scriptures became more available via such Protestant inventions like the printing press, and the common man learned to read and write, was Western Civilization truly able to establish a foothold in the world. As the Roman Church finally began to fall apart, and true light began to reach the common people, they took that light and changed the world forever. The Crusades were military campaigns started and promoted by the Roman Church from the High Middle Ages to the Latin Middle Ages. Many of the Crusades, such as the People’s Crusade and the First Crusade, were aimed at retaking the Holy Land from the Muslim conquerors. The progress of the Reconquista. What began the European drive against the Muslims was the successful taking back of Spain, called the Reconquista, which ended in about 1300 A.D.. The Muslims advance into Europe having been stopped successfully by the Templar Knights in Sicily as well, and being held at bay with some success by the Byzantine Empire, the Christian World began to view the retaking of Jerusalem and the Holy Land as being a possibility, and not doomed to total failure. The reputation of the Muslim invaders, as being unstoppable, had been diminished. In 1095, Pope Urban II called for the First Crusade. Not only did the knights and nobility respond to the call, the peasantry did also. The First Crusade was in two waves; the first, the Peasants Crusade. Marching along south to the Mediterranean coastline, their numbers swelled greatly. 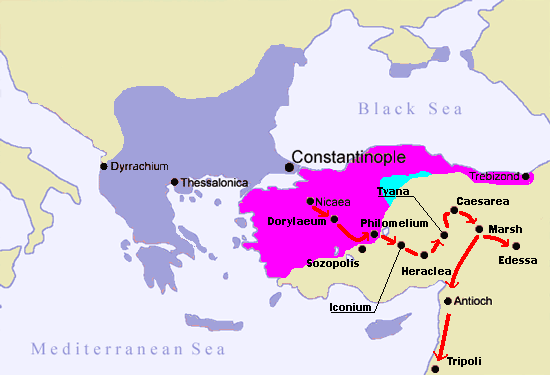 As the sea did not open before them, the began the long march around to march through the Byzantine Empire into Turkey and begin the march into the Holy Land. However, the peasantry, without any military strategy or technology, ended up being defeated and nearly annihilated in Turkey by the skilled Muslim soldiery. So, it was up to the second wave, the professional knights and nobility, who began the march into the Holy Land in their own two waves. Thus, when the Muslims drove back the first, a fresh wave came up to the rescue, crushing the Muslim defense. They made it all the way to the gates of Jerusalem to find the wells poisoned for miles around, as well as to realize that they had no building supplies or materials with which to lay siege to the well fortified city. However, just in time, a fleet sailing from Genoa arrived with building materials. The Crusaders built ladders and scaled the walls, and the city fell. In the hands of the triumphant Crusaders, the population was subject to an all out massacre. Everyone was killed except those that were able to identify themselves as Christians, and the Kingdom of Jerusalem was established, along with a few other Crusader States, such as Edessa. This victory wouldn’t last long, as the Muslims counterattack took back Jerusalem and then, one by one, the Crusader States. Numerous other major and minor Crusades took place, but with limited or no success, until 1291, as the city of Acre fell, the last Christian held stronghold in the Holy Land. However, other Crusades had taken place that were not destined for the Holy Land. One such was against the Albigensian Christians. The Albigensian Crusade (1208–1241) began with the excommunication of the Albigensian Christians by Pope Innocent III, followed by their massacre by the Crusaders who came from northern France into the independent southern France to not only carry out Pope Honorius III’s command for a Crusade to take place but to place southern France under the French crown. Such were the Crusades. Though the First Crusade was a success, as much of the Holy Land had been retaken, following Crusades were not, and the Holy Land continues to be under Islamic control to this day.